Industrial use of nanosecond lasers for applications such as marking, engraving, cutting, and even micromachining is well known—however, the use of these sources for welding and joining is relatively new. Most applications of high-peak-power, short-pulsed lasers tend to be related to material removal, so their use for joining is perhaps counterintuitive. However, the versatility afforded by master oscillator power amplifier (MOPA)-based nanosecond fiber sources give unparalleled flexibility in terms of control of the output characteristics. These lasers can be used, for example, with high-peak-power nanosecond pulsed output with tunable pulse duration and high frequency-modulated quasi-continuous-wave (QCW) modes, as well as operated as a more conventional continuous-wave (CW) laser. FIGURE 1. Examples of various metals welded to stainless steel. Compared to CW and QCW sources, they have very low average powers (typically <100W) and pulse energies of just 1mJ, which is 1000X less than typical diode-pumped solid-state (DPSS) and QCW pulses. 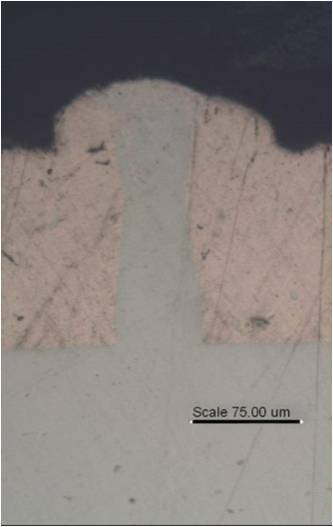 This does currently restrict the use of pulsed fiber lasers to relatively thin sections up to 0.5mm, but recent results show that penetration depths of up to 1mm are possible. Operating with pulse durations often in the 100–500ns range, with peak powers of up to 10kW and pulse repetition frequencies of >50kHz, these lasers are significantly differentiated from conventional QCW sources. This ability to tailor the input energy characteristics is key to their use as a tool for joining. When bonding thin material, there is a requirement for reliable joining processes that avoid over-penetration, distortion, and warping. In conventional keyhole welding processes, overcoming material thresholds requires relatively high powers (usually >200W). This challenge is even greater for joining bright metals, and even more so for dissimilar material combinations. Joining dissimilar metals has long been a challenge for welding and design engineers who have often been told that it’s difficult or that it can’t be done. As any metallurgist will tell you, it is the combination of physical properties and metallurgical incompatibility that governs weldability. However, there are a lot of potential applications that require such joints, particularly bright metals to steels and aluminum alloys. The research focus in this area has yielded incremental improvements. Fundamentally fusion welding of dissimilar metals creates problems associated with the formation of brittle intermetallic phases. These can form planes of weakness, making the joints susceptible to fracture. These intermetallics typically manifest themselves in the interface of the weld pool and form based on time and temperature. Heat input is a key factor in their formation. SPI Lasers’ nanosecond welding process (patent pending) has provided a differentiated mechanism that has proven itself to be extremely capable in joining a wide variety of dissimilar metals (FIGURE 1). The use of nanosecond lasers for joining is unlike conventional welding in that it does not generate a large melt pool, so opportunity for the formation of these unwanted intermetallic phases is inhibited. The spot size is very small (often in the 30µm range), so to make spot welds or linear welds, techniques such as spiralling and beam wobbling are used. The spot size can be easily changed by appropriate selection of beam expanding collimators. The majority of the processing was conducted with SPI 70W EP-Z laser with an M2 of <1.6. However, for some applications, it has been found that a broader energy distribution, as offered by the 70W HS-H model with its M2 of 3.0, results in improved joint characteristics. The joining of copper to aluminium (with the copper on top) is a joint of significant commercial interest. It is technically challenging in that the copper is highly reflective and conductive, presenting the laser with a high threshold to enable coupling of the incident laser beam and the subsequent initiation of the weld. FIGURE 2. 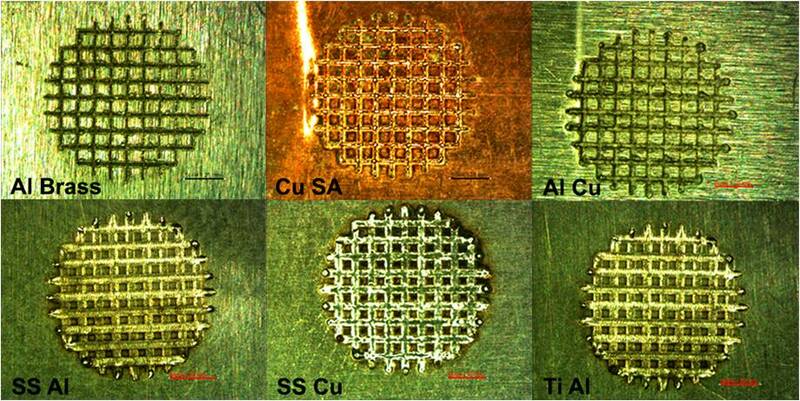 A cross-section of copper (top) into aluminium (bottom) weld using a redENERGY G4 Pulsed Laser. The high peak power of the nanosecond pulses is crucial to overcoming this threshold and aids coupling into the material. 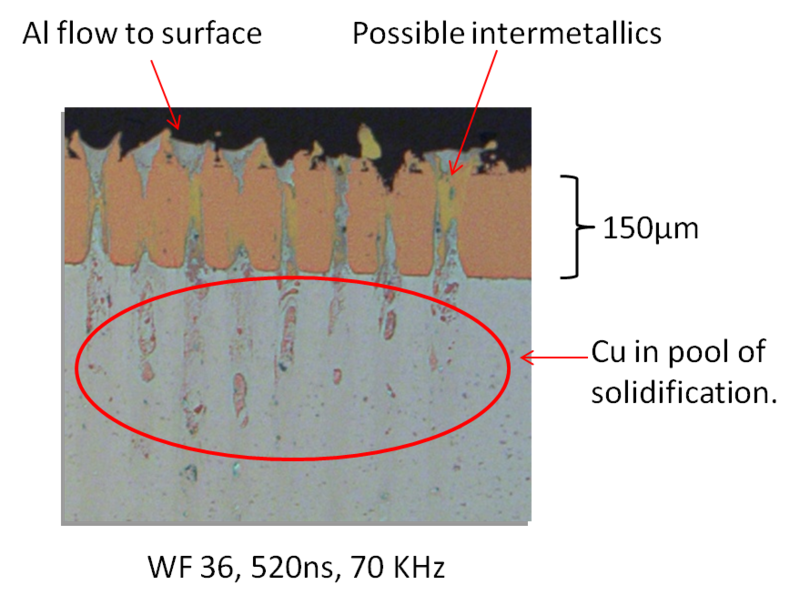 The cross-section through a weld made through copper into aluminium shows the beam penetrating through the upper layer of copper and melts the aluminium below FIGURE 2). There is incomplete mixing and the aluminium is drawn through the copper to form more of a metallic bond between the two layers, resembling a rivet. A single-pass joint gives only 30–50µm of joint width, which may be insufficient for general applications. A spot weld created by a spiralling beam path is a more practical solution, where the size of the weld is dictated by the number of circular passes in the spiral. These spot welds do not show the characteristics of a conventional spot weld, where there is a distinct single weld nugget. The spatial dimensions of the spiral can be varied to change the weld characteristics such that passes overlap, creating a more homogeneous joint. A 0.8mm-diameter spot can be achieved through 150µm copper into 400µm aluminum in under 300ms using a redENERGY 70W EP-Z SPI pulsed laser—tensile testing has shown the joint strength to be >26lbs (for 3 × 0.8mm spots made in ~1s). Testing has also shown that use of secondary passes can improve the cosmetic appearance of these joints and can even improve strength, particularly if no shielding gas has been used. FIGURE 3. An example of a section through a spiraled spot weld. Seam welding with a wider weld width can be achieved by using a wobble welding technique, with the wobble amplitude and frequency being optimised based on the material types and thicknesses. A wide range of material combinations have been made, but material combinations that appear to be of general interest include copper to aluminium, aluminium to copper, and stainless steel to aluminium. A major area of current interest is the joining of battery cells. A wide range of materials are being studied, including aluminium, copper, and nickel-plated copper with a view to produce a reliable and tolerant process that generates strong welds with no burn-through or witness mark on the battery contact. Heat input into the part can be critical and this can be accurately controlled by nanosecond welding. The material thickness of the tabs tends to be in the 250–500µm range, which is generally within the capability of the nanosecond joining process range. The nanosecond welding process offers multiple options in the join design—for example, it is possible to produce a single large spot or multi-spot arrays. Studies have shown that although the contact area per given welding time was roughly the same, multi-spot arrays have proven to be stronger (both in tensile and peel strength) and give greater control of heat input. 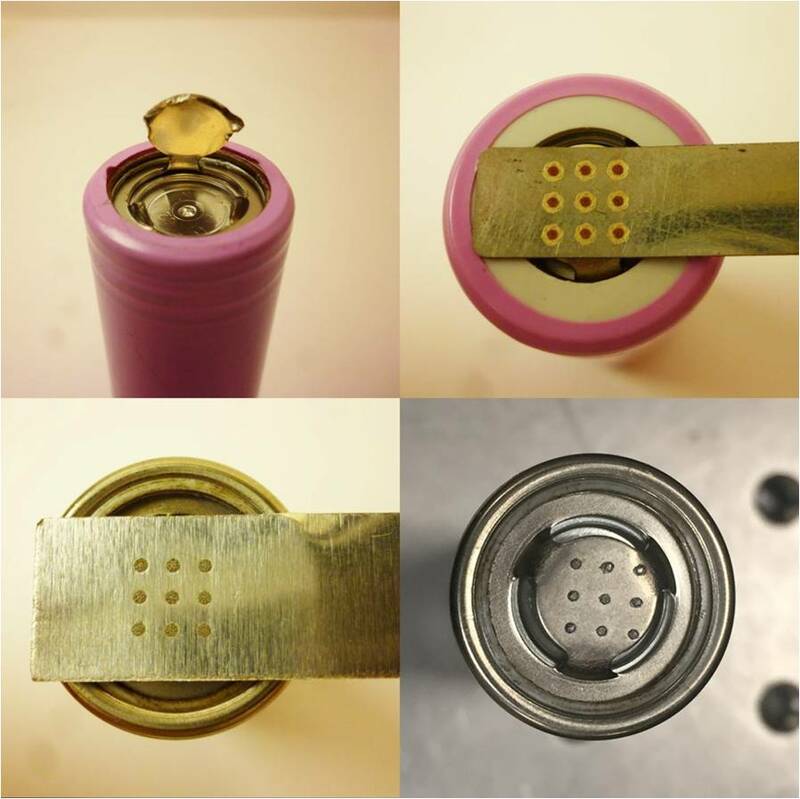 Using a 3 × 3 array made in approximately 2s using a 100W laser, it can be seen that no burn-through or witness mark is made on the underside of the battery cap. Peel testing has shown these joints to be incredibly strong and that the failure occurs in the heat-affected zone (HAZ) adjacent to the weld nuggets, leaving the weld stubs intact. FIGURE 5 shows welding of nickel-plated copper and aluminium tabs to standard lithium-ion cells. FIGURE 5. An example of battery welding that lacks burn-through and witness marks. Weld geometry flexibility offered by the nanosecond welding process through use of scanner-based beam delivery opens up many possibilities to design joint configurations. Whether it’s for electrical conductivity, pull or peel strength, penetration and nugget shape, utilising available space, or minimising heat input (no witness mark welding), the weld shape can be optimised. An example of an interesting join option is the use of grid patterns, which can be done at extremely high speeds to cover available areas. This has been shown to be extremely effective in joining a wide range of dissimilar metals, including copper on 718 super alloy, aluminium on brass, aluminium on copper, stainless steel on aluminium, stainless steel on copper, titanium on aluminium, and titanium on copper (FIGURE 6). FIGURE 6. An example of grid-pattern weld geometry, with a welded area ~4mm in diameter and done in ~1s. Industry sectors are showing strong interest in welding thin dissimilar such as; consumer electronics, semiconductors, batteries, sensors, and medical. Using the nanosecond welding process most combinations of widely used metals can be joined with acceptable joint strength. Of course, there is still a great deal of work to be done to categorise the various material combinations and the understanding of the process fundamentals is on-going, but what is certain is that this opens up new opportunities for today’s manufacturing design engineers. 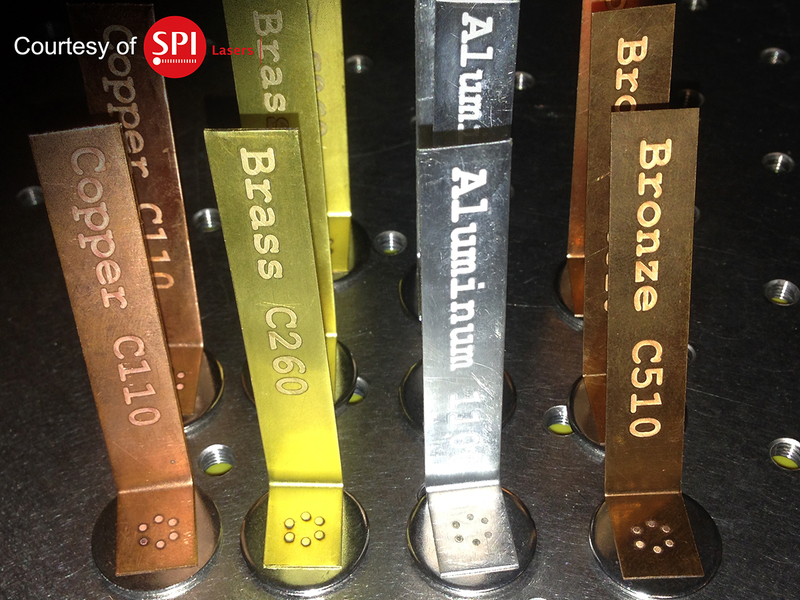 SPI’s nanosecond lasers will open up an exciting new dimension to joining of both similar and dissimilar metals. JACK GABZDYL (jack.gabzdyl@spilasers.com) is vice president of the Pulsed Laser business line and DANIEL CAPOSTAGNO (daniel.capostagno@spilasers.com) is Applications Manager, SPI Lasers, Southampton, Hampshire, England; www.spilasers.com.